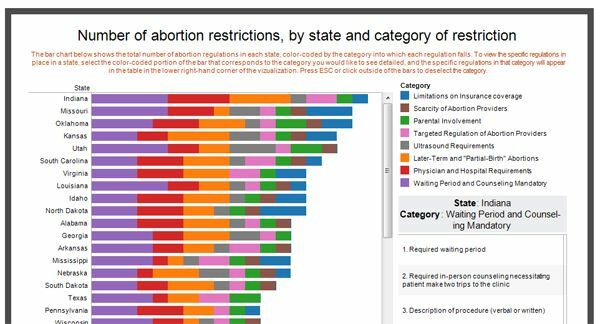 Below is just a screen capture of what is an interactive infographic about national abortion restrictions in the US, by state and type of restriction. Click on the image (or here) to go to the interactive infographic. Note that my state of residence, Indiana, tops the list. As I have mentioned previously in comments, I feel decidedly less safe because of the anti-abortion legislation in Indiana, particularly the legislation dealing with "late term" abortions. I am not desirous of getting pregnant, which makes me concerned about abortion restrictions since I am a sexually active fertile cis woman of childbearing age—but, if I were keen to have a child, I would be even more concerned about carrying a pregnancy to term in a state that values a fetus' life more than mine. Which underlines one of many inherent flaws in "pro-life" rhetoric and policy: It actively discourages from becoming pregnant any woman who is not willing to potentially risk her life to have a baby. That is, beyond the usual risks that advanced medicine is now mostly able to contend, in those places where it's allowed. When I see that colorful display of anti-choice legislation across my state, all I see are barriers to informed, enthusiastic, safe, uncoerced reproduction. I'm certainly not the only one.